Fiona Bruce chairs this new BBC4 quiz where two teams of three answer clever questions by finding the answers in a hexagonal wordsearch. As a replacement for Only Connect (which has of course moved to BBC2) it doesn’t look like the apple has fallen far from the tree – teams of three, large range of subject matter, a bit where the teams have to try and find a perfect solution to a grid – so we shall see how much the wordsearch element adds to the mix. I’ll be interested to hear what people think of the “decaying” aspect of the Hive (Sidenote: I think referring to the gradual removal of letters from the Hive as decaying is fantastic), as to whether it is a help or a hindrance. Obviously having less letters to look at makes things easier overall, but from playing it, having letters you are looking for words in disappear mid-thought can be very off-putting. I presume there’s only one legitimate answer on each grid at the start of the question? There certainly should be just one answer. In the situation that Alex mentions, Beethoven wouldn’t be there in full at the beginning, but enough of it may well be to be a plausible-looking red herring. We did have one instance in the warm-up where the question was “A type of song” and the answer they were looking for was “Madrigal”. But “Aria” was also available, seemingly by accident, and we were told that would have been accepted. Nothing like that came up when were filming for real. Simon, did you ever find you completely lost your train of thought because one of the letters you were using disappeared? Or did you just immediately move on to another letter? Our train of thought was frequently derailed, hit the buffers, or was downgraded to a rail-replacement bus of thought. That’s the point of the show, though – you need to be able to think fast enough not to get stuck going down a dead end. Now that the first episode has aired in its entirety, may I please have a complete rundown of the format? Probably going to give my opinions on how each round works in a different post, but I’ll be happy to give you a rundown. The basic concept is that the answer to the question you are given is hidden in a hexagonal “hive” of letters, the answer may wrap around and contort itself through the hive, but there is only ever one correct solution to find. So the first round(s) involves finding a single word in the hive based on a question like “You’re looking for a bird native to the UK”. After a few of these, players then have to find two separate answers in the same hive that are linked in some fashion, with a question like “You’re looking for a moon of the solar system and the planet it orbits”. All questions in this round are worth one point. The next round involved players finding three seperate answers in the same hive, which all fit a theme like “Winners of the Turner Prize”. However, each player in the team must find the answers on their own one by one, passing if they cannot see any (teams may only pass twice) to their next team member. One wrong answer in this round locks the entire team out, teams receive one point per answer. Teams get 10 seconds before seeing each hive in this round to brain dump everything they know about the subject. Each team does two of these. The third round is the Superhive, each team gets one much larger hive which contains numerous answers each fitting the same theme (elements on the periodic table, for instance). The goal here is to use every letter in the hive to make up every answer, with a point for each correct answer (I believe all correct answers, even those which stop a perfect completion of the hive, is worth a point). The final round is quick fire hives, where there are several answers to different questions in the same hive, these questions are asked on the buzzer against the other team, point if you’re right, lose a point if you’re wrong. If during the allotted time, every question for a hive is used, the hive is “refreshed” and new letters are put in. The trick here is you can look for words before questions are asked to try and get the jump on the other team. I think that’s about it, shall add a bit more if needed. I found this while writing the Wikipedia article for the show; thank you, I’m used to having 45 minutes per show to write the article not 30. I will say, however, that in round three a perfect hive is worth ten points. Although their gameplay formats are different from each other, I would therefore say that the structure of this show is very similar to Only Connect. * I think comments about Fiona Bruce copying Vicky C-M’s style are a bit unfair given Brucie did Call My Bluff, a similar middle-brow quiz hosted in a similar not-really-arch style, over ten years ago. Also I quite enjoyed how exciteable she got. Thumbs up for Brucie. * Similarly I think suggestions that the show is pretentious are a bit harsh. It all felt pretty straight-bat to me. * It annoyed me a little bit that questions in round one which required two answers weren’t worth more than questions requiring one, in fact these questions in theory score fewer points because of the way the points are allocated. I would suggest that the minimum score in R2 of OC is quite a clever and overlooked point of differentiation to R1, for more difficult questions. * However the final round is a much better fit for the format than missing vowels is. * The questions in HM were well written as you’d expect from the talent behind them, but they don’t really inspire the same amount of entertainment value as an OC question which invite a bit of comment even if you don’t know the answers. Ultimately how much you like this show in particular is going to depend on Can You Do The Thing. I found myself staring at the letters on the screen blankly in frustration for quite a lot of it. Maybe the letters are too close together? This is a shame because on paper it’s a clever idea I think but I didn’t really find it that much fun to watch, sadly, on the other hand if you are the sort of person who can Do The Thing you’ll enjoy a decent quiz. It opened to almost 505k/2.6% which is roughly in line with where OC started, IIRC, so it will be interesting to see where that goes. It’s like Snake twinned with Blockbusters. I think it will grow on me however my main criticism of the whole thing was actually the quite cheap sounding incidental music that made it feel a bit cheap. A couple of points I can add as a contestant. * Alternating lecterns – purely a matter of space, I suspect. They literally couldn’t have got six lecterns in the studio (they had to dismantle the desks each time to film round two and then reassemble them afterwards). * “Ultimately how much you like this show in particular is going to depend on Can You Do The Thing.” I think it may be something that you have to try a few times before you get your eye in. Certainly the contestants found this. We all forget that we’ve been watching Only Connect for 10 series, and for a lot of people it took a few episodes before they could actually get their head around it enough to answer anything. (That being said, there are a lot of people who claim to enjoy OC even though they only get a couple of answers each game). I’ve said elsewhere that I’m not convinced this particular episode was the best introduction to the show, simply because the teams were just too good. They often got the answers so quickly that there was little scope for playing along at home. I can say without fear of spoilers that that won’t always be the case! Sticking that close to the incidentals of the Only Connect format while changing the heart doesn’t really work. OC could afford such non-interactive rounds due to ludicrous play-along factor, but play-along was surprisingly poor for me. Round 2 is particularly annoying, with far too many things going on (Category choice + prep + pass limits + time limits + non-linear scoring). The farewell puzzle is a nice touch though. Players should really be able to trace their answer in all rounds rather than tapping individual letters. The required software and UI for resolving the trace into letters and undoing is no longer exotic. It feels cheaty not tracing the whole answer, and then having the computer do it just doubles the reveal time. In the first episode, questions were too British for me to have much of a chance, so that may be colouring perception, but they feel very much dry, even when they aren’t padded with a mini-lecture on the topic. OC was a bit like that in its early season, so it may find its Lateral Scrabble Nirvana in time. Any reason to not use Gotham is a good enough reason for me. I know, I’m a heavily-shallow font geek, but DAMN that font is overdone. I enjoyed it- only round I have a major problem with is the 2nd one; it just seems a little out of place for some reason with the passing and such. I do get a major Now You See It vibe out of it (the last round you could say is most like it). In other news, I’m currently waiting to hear whether I made it onto Freeze Out or not. If I don’t hear anything by the end of the month, then it’ll be a no. However, I just got the call from 1000 Heartbeats, and I’ve been called to audition on August 1st, so I have a fallback should I need it. Out of the two shows, I think I’d rather want to be on 1000HB. Nothing against Freeze Out but they haven’t even got the format fully worked out yet, so I have no idea of the rules. Just being nosy when did you send in your 1000 HB form, so I can see how long I need to realistically give?! 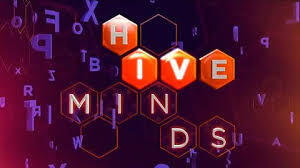 Agree with the bulk of comment here: Hive Minds serviceable, has promise, not quite there yet but neither was Only Connect until about series 3. A lot of questions left me thinking “and…?”: there’s a discussion they’re not having. Certainly agree about the graphics: I don’t think the show’s built for my 26-inch SD set. Ratings Bear memorial fact: Only Connect began with 256,000 (four repeats across the week might have added 20%), and didn’t break 500,000 until well into the third series. I joined this five minutes late only just remembering it was on which doesn’t bode well. Concensus is it was easier to playalong with this week, and certainly even I got a few answers. I still think Fiona is brilliant – like someone hosting a highbrow quiz during a sugar rush but in a good way. But for me the quiz feels boringly one note – it’s actually really hard to come up with a twist answering gimmick that doesn’t wear thin quite quickly and I think I’m reaching my limit, half an hour of it feels a bit much. Your mileage may vary, but I can’t think of many Q and A shows that are successful that aren’t basically Q and A.
I want to like Hive Minds, but I am having issues calling it a proper Q and A. If the questions were more pinned (and gettable? ), I’d probably fall right in love. Heck, even if they were University Challenge length questions (even if they had horrible swerves), that would suit a game like this nicely. Someone once noted that a good quiz should have “I know that” or “Oh! I didn’t know that” moments. For me, if I can’t seem to guess the answer they’re thinking of, I literally stop caring. That’s harsh in a quiz. Maybe that’s the material or just how it’s presented. Other comments on the host and presentation, I will leave to the professional commenters above. Any idea of how this is rating? Well I completely forgot it was on tonight. Yes, I’d be interested in ratings as well. The online reception has been pretty much universally negative – is this reflected in the numbers watching?